This is a collection of the best travel WordPress themes for travel websites, travel blogs, travel businesses, travel guides, and other travel related websites. If you have a travel or tour business, a city or country travel portal, a travel guide website, or just want to share your travel adventures online with a travel blog, these travel themes combined with the power and ease of WordPress make the perfect platform. 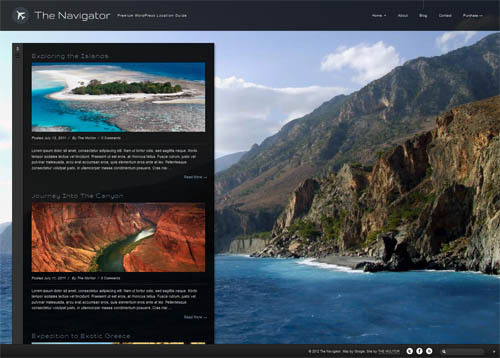 The travel WordPress themes below have been designed specifically for travel websites in mind. Some have specific travel features build in such as maps and geo tagging functionality, review / rating systems, photo galleries, integrated Google maps and more. This is a dynamic showcase that is updated with new themes when they become available, so be sure to bookmark and check back again. If you know of any other travel WordPress themes we have missed please let us know in the comments. The Trip is a travel WordPress theme suitable for travel boggers, tour operators, and others wanting a bold and modern blog. 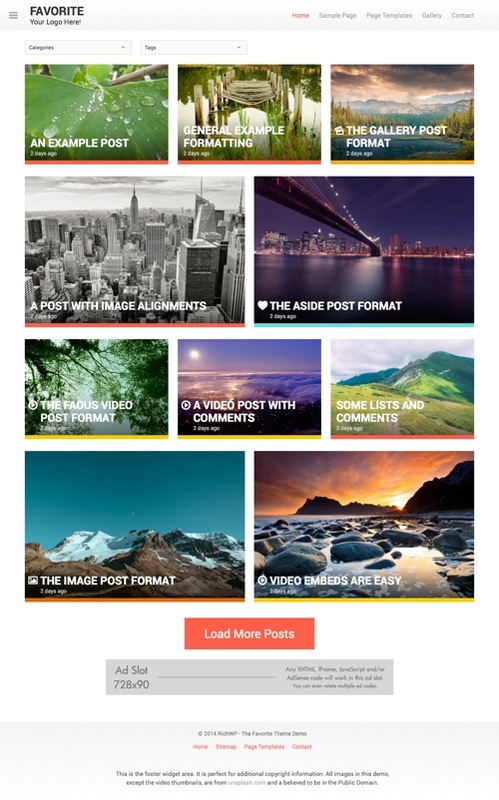 The premium theme from ThemeFuse is ideal for travel bloggers wanting to write and share their photos of your travel experiences with its clean typography and large featured images. Its designed on The Core framework which has heaps of great features and options for easily setting up, customizing and managing your site. MH Magazine is a highly flexible WordPress magazine style theme with lots of great features for easily creating a modern and professional online magazine, blog, news site or other editorial project. The Travel Version of the theme is ideal for online travel magazines and travel blogs, city and country travel portal websites, personal blogs about your travelling and journeys and other travel websites. El Greco is a travel guide WordPress theme. The premium theme from cssigniter allows you to easily build a stylish and functional travel guide website for a country, region, or city. It has a clean and minimal design that allows your images and content to stand out. It also been designed with a layout for easy overview and access to different categories you might want to include such as accommodation, food and dining, attractions, leisure, culture, reviews etc. Some of the other notable features of the theme include: a featured slider on the homepage, retina ready and responsive design using the Bootstrap framework, powerful widgets, customization options, theme settings panel, custom menus, shortcodes (via a plugin), colour variations and more. 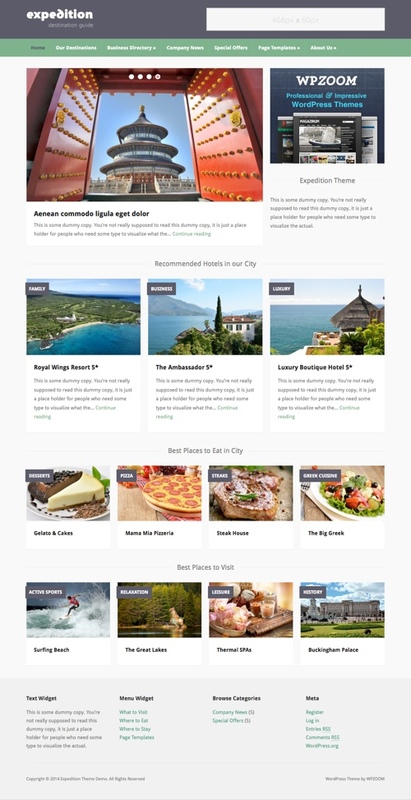 A versatile premium WordPress travel theme from WPZOOM. The theme could be used for a wide variety of travel oriented websites including travel agencies, city guides, travel blogs as well as portfolio and small business websites. Features include the WPZOOM options panel framework for easy customisation, featured content slider on the homepage, 5 custom page templates, custom homepage with custom widgets and more. 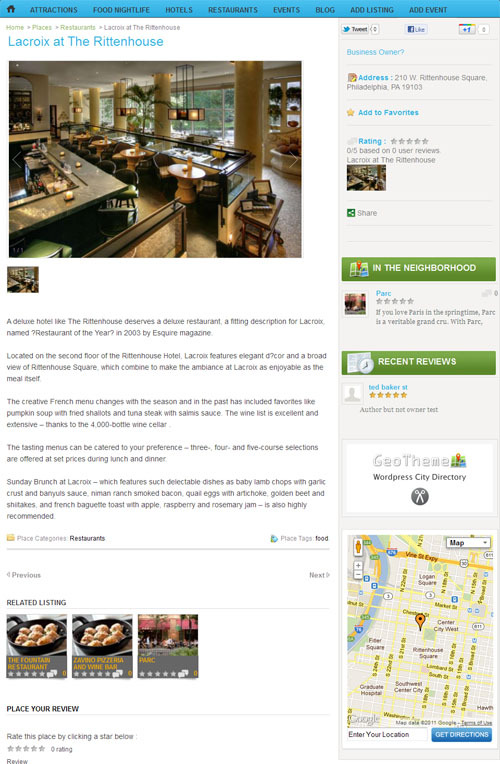 A location based WordPress theme that pins your posts on a map. The premium theme from Elegant Themes allows you to create location based listings, making it an ideal theme for building a travel website or blog, a travel guide, local business directory or any other location and map oriented website. Tourism is an attractive travel WordPress theme with a mobile responsive design. The premium theme from Gorilla Themes has been created for travel journal websites, city portals, travel blogs, tourism websites, and other travel related websites. Some of the key features of the theme include: a custom homepage layout with carousel slider and featured destination sections, 5 colour styles, multi category search module, video widget, photo galleries, translation ready, and a mobile responsive design enduring it works on iPhones, Android devices and all other computers and mobile devices. 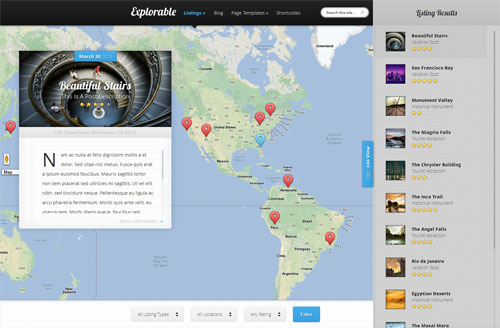 A premium WordPress theme ideal for travel blogs and/or location guides. 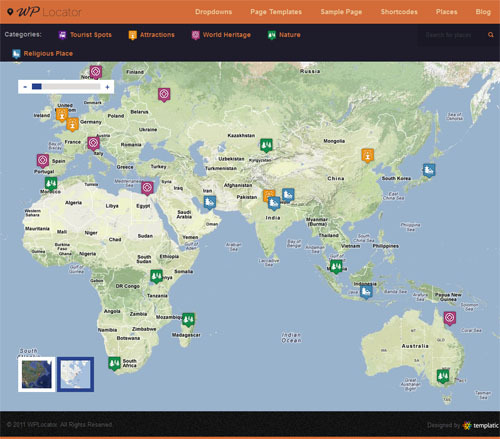 This directory-based theme utilizes Google maps to display exact locations and provide users the ability to interact with the location. A stylish travel WordPress theme with a mobile responsive design. The premium theme has a nice magazine layout ideal for those wanting to run a magazine website related to travel, city portals and lifestyle in general. Some of the the key features include: featured content slider on the homepage, a fully featured search module, 5 colour styles, thumbnails images, video rotator, banner management , full featured theme options and more. 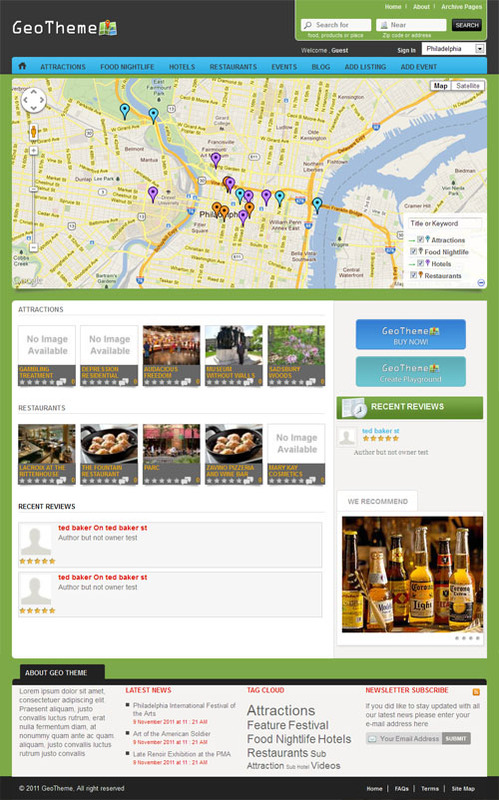 A sophisticated location based directory / portal WordPress theme from Templatic. The theme is designed for creating city, region, or country portal or directory websites with information about tourist attractions, shops, restaurants, business, places of interest etc. The theme features a customisable homepage layout with feature map or banner slider, custom page template with map, gallery, address, info, rating and review options, user registration management, design settings options and much more. 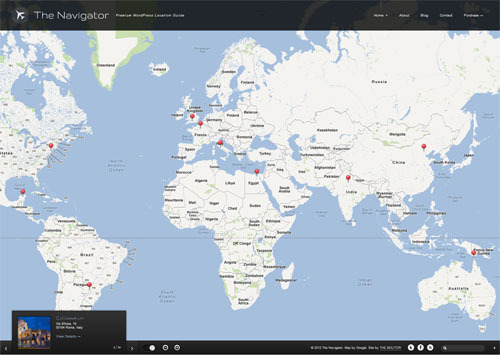 A location guide and map WordPress theme with a full screen map interface. This commercial theme from Templatic allows you to map and showcase places of interest on a Google map together with descriptions and photos. You can switch between road map and satellite views on the fly and have street views on place pages. Other features include custom fields to add extra information about places, unlimited colour skins, integrated shortcodes, and more. The perfect theme for any travel, nature, culture like blog/site. Features include 2 different homepage designs, Twitter integration, featured slider, gallery, shortcodes, options panel and more. A WordPress theme that has been created specifically with “travellers” in mind. It comes with many built-in features perfect for people looking to share their travelling experience. Great for photographers who spend a lot of time travelling around the world or for anyone else that loves to discover the world and share it. 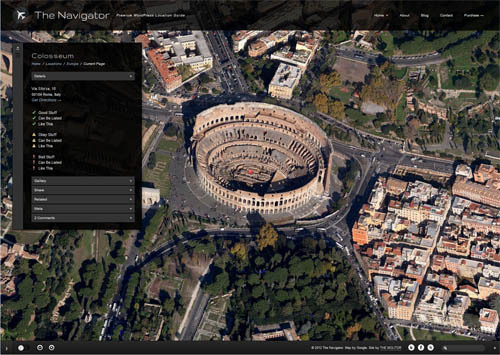 Features include Google Maps integration, photo gallery, 4 colour schemes, custom map widget, options panel and more. A geo directory WordPress theme that allows you to build a country, region or city directory website. The premium theme has a plethora of features allowing you to create an interactive geo location directory and review website for tourist attractions, shops, restaurants, business, places of interest etc. Features include geolocation and proximity search functionality, monetization options, Google Maps integration, events and places custom post types, review management, listing submission and more. GeoTheme is a “forked” version of the GeoPlaces theme from Templatic. Winterland is a travel WordPress theme with a winter look and a magazine style layout. 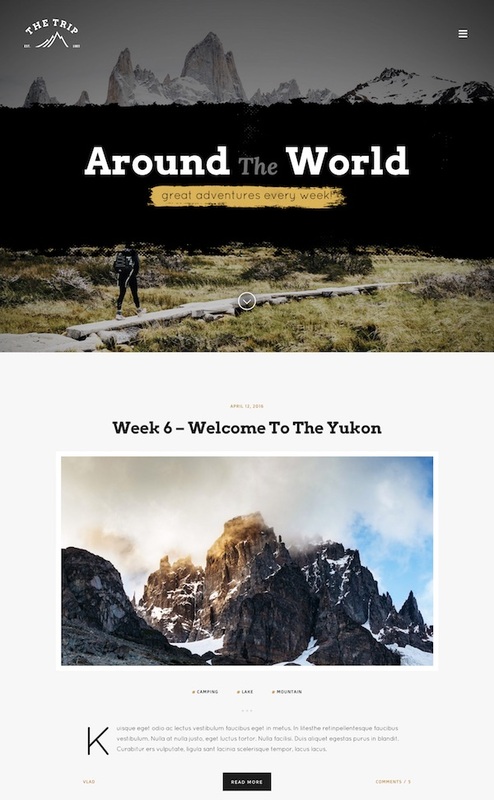 The premium theme from Gorilla Themes is ideal for those wanting to make a travel magazine website for ski resort areas, cold regions of the world, or any other travel magazine website related to city portals, lifestyle or travel in general. It has a custom homepage layout with featured slider, video widgets, “must do destinations” section and the latest blog posts. The theme has a full featured multi search module where you can pick any combination of categories to display filtered results. Other features include: 5 colour styles, logo uploader, automatic thumbnails, Facebook integration, translation options, customized archive and search pages and more. 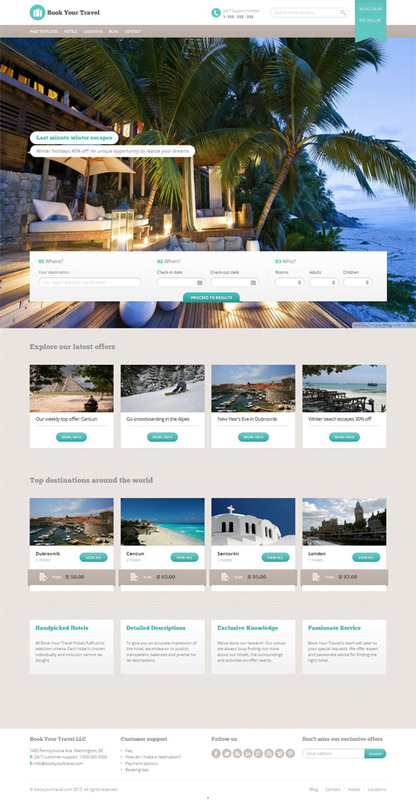 The Book Your Travel WordPress theme is a mobile responsive online booking WordPress theme designed for hotel booking portals, travel agencies, hotels, resorts, bed and breakfasts, guest houses, villas, travel blogs or other travel business websites. 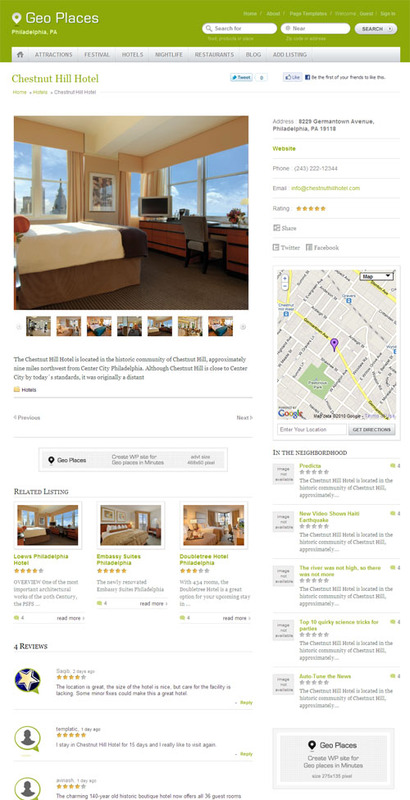 The theme lets you add hotels and the hotel information (rooms, facilities, hotel images etc) on one page. You can also manage room information – assigning rates based on date, set facilities etc. A booking system is also built in. Some of the other features include: search filtering options (sort by price, stars, rating, date, destination and accommodation type etc), room availability checker, vacancies based on date, 8 colour schemes, translation ready, currency options, advanced admin options panel and more. The Favourite Theme is a multi-purpose WordPress theme with a unique and highly visual design. 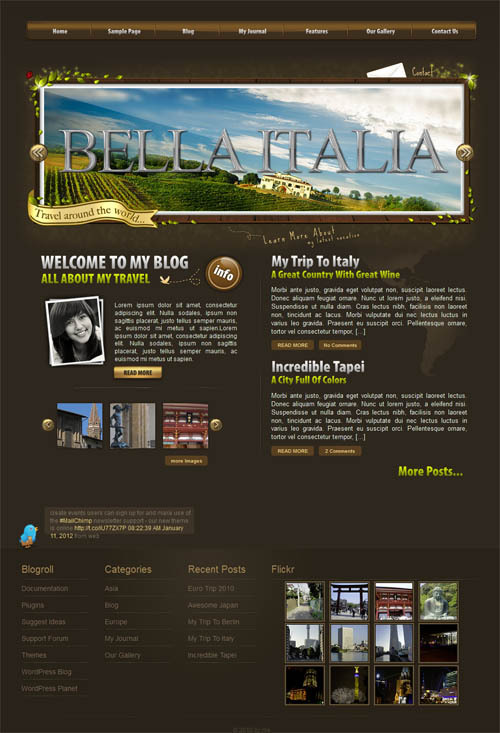 The premium theme from RichWP could be used for travel blogs, travel websites and others. It has a flat and minimal design with a fully responsive and adaptive layout that scales to display nicely on all mobile devices. Some of the other key features of the theme include: easy logo integration, widgetized areas for advertising or other content, colour change options, search-optimized HTML5 code architecture, useful set of page templates, multi-site support, support for native WordPress post formats, translation ready, hidden slide out sidebar, lazy load read more post button and more. There are also lots of other fantastic magazine WordPress themes, and blogging WordPress themes that would be suitable to be used as a base for a professional travel business or travel portal website. So your options are not limited to only the themes above.